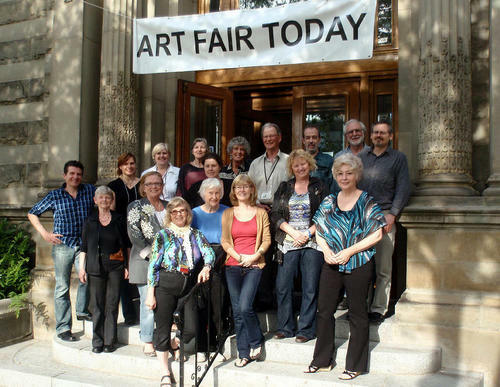 MID-MAIN ART FAIR was established in 2010 by Enda Bardell, visual artist, to promote and sell work of emerging and established mid-career artists of the greater Vancouver area at the elegant HERITAGE HALL, located in the center of Vancouver at 3102 Main Street, V5T 3G7. This small group of well established artists have a strong presence with a good websites, work in a variety of mediums from abstracts, florals, landscapes in watercolour, acrylic, oil, Chigiri-e, photography, sculpture, to smoke-fired vessels. The 3300 square foot main floor of HERITAGE HALL has 18 foot high ceilings, stained glass chandeliers, and lots of natural light from the large windows. It is the perfect location to show fine art work with plenty of room for guests to view the work from a distance as well as close up.